attacking Linspire Employees, who ended up ahead $217,000. 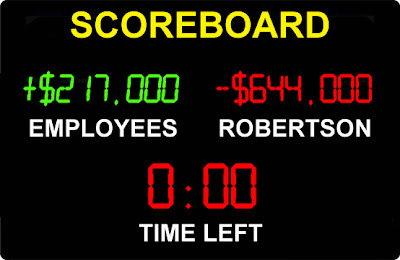 UPDATE: For an updated Scoreboard, read here. As I predicted earlier in this blog, Robertson is taking his massive losses in the courts and trying to spin it as a victory for himself. He lost hundreds of thousands of dollars attacking innocent employees, yet in his most recent Michael's Minute, he tries to justify his greedy behavior by pointing to the few counts that went in his favor, but of course, he leaves out the DOZENS of counts that didn't go his way. I'm proud of the small amount of damages awarded against me as I fought for the innocent employees. 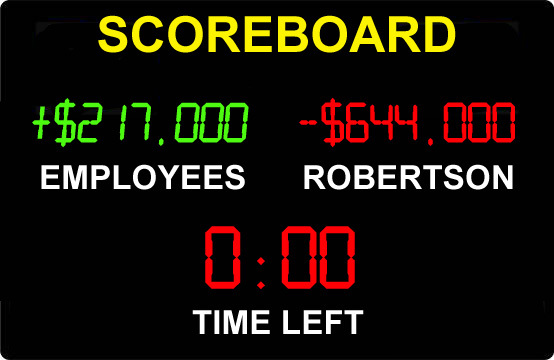 The time, energy and money I spent was DEFENDING good people, and trying to see employees treated with some respect, where as Robertson spent over a half million dollars attacking them. In the end, the court OVERWHELMINGLY sided with the wrongfully accused employees, but you'd never know that reading Robertson's blog. Don't just take my word about the REAL Michael Robertson, visit Freespire.com and read the comments from dozens of people who know and have worked with Robertson. The bottom line is Robertson spent huge amounts of money attacking innocent employees, while I spent my energy defending them, not taking one dime for myself. Oh, and of course, the Linspire shareholders are still waiting to hear from Robertson what happened to their investment. PS: Not surprisingly, given the source =), there were several blatantly false statements in Robertson's blog, which I have pointed out to him.